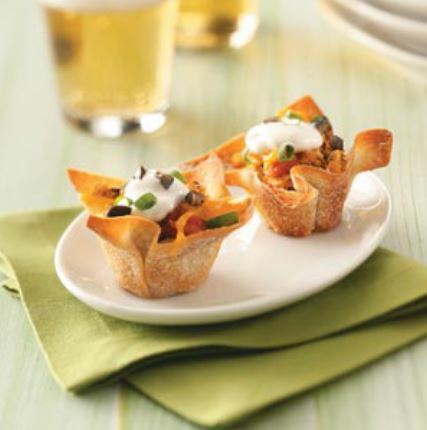 For Cinco de Mayo, try these stuffed wonton cups with a Southwest-style chicken filling. You can freeze them, too. Just reheat after thawing. Sprinkle chicken with taco seasoning. In a large skillet coated with cooking spray, cook and stir the chicken over medium heat for 5 minutes or until meat is no longer pink. Transfer chicken to a food processor; cover and process until chopped. In a large bowl, combine the chicken, onion, half of the salsa and 1 cup cheese. Press wonton wrappers into miniature muffin cups coated with cooking spray. Bake at 375° for 5 minutes or until lightly browned. Spoon rounded tablespoonfuls of chicken mixture into cups; top with remaining salsa and cheese. Bake 15 minutes longer or until heated through. Serve warm. Garnish with sour cream, green onions and olives if desired.